When my sister saw me in this outfit in a dark denim skirt with leather panels, she said, "Looks like you're going to the office." which is fine...except that I wasn't. I searched her face for signs of humor, but there was none, so I swapped my skirt to full on leather. I don't know about your office, but most corporate offices don't really approve of leather material, except maybe for the bags and chairs. This cooler January weather in Manila is a welcome reprieve from the hot humidity of 2012. It's just a little confusing though, because December's usually the coldest time of the year and now it's January. And who knows what February will bring. (Please bring cool winds!) I'm not complaining though. I'm all for cooler weather to justify the wearing of long-neglected jackets, without getting odd looks from strangers. When you live in a tropical country like ours and the temperature drops to the twenties, you rejoice! i like the hues on this look of yours, Abi! Hopefully no typhoons coming anytime soon. Stay safe! Thanks dear! :D You too! cool outfit!It doesn't look like you're going to the office. I really like this pencil leather skirt! This definitely does not scream 'office' to me! You look hot :) Love those sandals! I stalked those sandals until they were on sale! How cute is your yellow top with the bow!? LOVE it. You look so pretty! Such a pretty lady. I like your style here, Abi! The yellow top is very pretty along with the pencil skirt. Nice sandals as well. I really love the accessories the most of this entire outfit, especially the necklace. Love the leather skirt! It looks great on you! such a chic look! congrats on getting out there and meeting your resolutions! 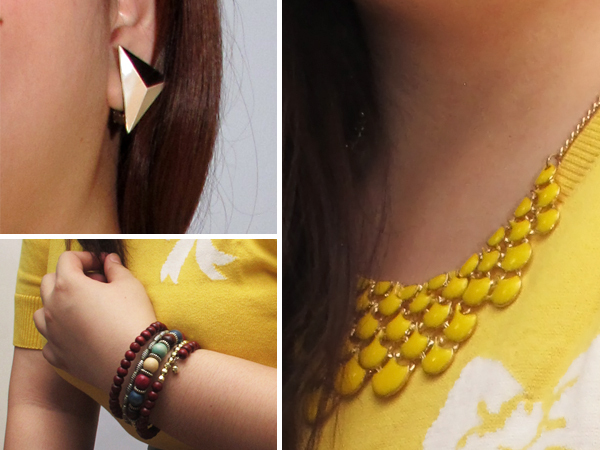 I love all the yellow, the necklace, top, and sandals are all adorable! The leather gives it a cool, edgier vibe as well! As we are trying to stay warm, I hope you are staying cool! Have a wonderful day! Thanks Hannah! I am...so far! Haha! I live in a very warm place and it's already heating up. Joy. You're wearing one of my favorite color schemes! I love how you match from head to toe. Thanks Aki! It all began with the shoes! That top is so cute with the bow on it! You look great! I reallllly want a leather skirt. I love this grey one from ASOS curve (http://www.asos.com/au/ASOS-Curve/ASOS-CURVE-Exclusive-Leather-Pencil-Skirt-with-Jersey-Trim/Prod/pgeproduct.aspx?iid=2669433&cid=9577&sh=0&pge=6&pgesize=20&sort=-1&clr=Grey). But I don't see myself affording it any time soon!